Nahr Alma is the God of Blood and is worshiped by those in the Brotherhood of Blood covenant. Based on the item descriptions for Titchy Gren it is clear that servants of Nahr Alma have rejected all that is their world and now seek only to shed blood. 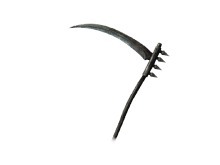 The believers carry out secret ceremonies, likely involving ritual sacrifice, where they use scythes. Nahr Alma and the Brotherhood of Blood seem to be the epitome of bloodthirsty psychopaths. The Knights of Blue have declared themselves sworn enemies of the Brotherhood though followers of Nahr Alma do not seem to care much about this, but rather simply find them a nuisance. It is likely the Blue Sentinels decry the Brotherhood of Blood because their motivations seem to be direct opposites. Nahr Alma urges his followers to not only kill each other, but invade the worlds of the 'helpless' and kill them as well. Whereas the Blue Sentinels are sworn to protect those who cannot protect themselves. Nahr Alma has a connection to the dark, as the Nahr Alma scythes used in ceremonies are imbued with dark. Titchy Gren, when aggroed will attack the player with powerful dark spells. Whether Nahr Alma seeks the Dark or the Dark is associated with Nahr Alma because of the Brotherhood's baser instincts is unclear. The reason for Nahr Alma's fascination with blood is not explained, but it is interesting to note that the robes worn by his followers absorb more souls, likely from those who are ritually 'sacrificed'. It may be that what Nahr Alma truly seeks is souls, and therefore strength, and the best way to get it is by shedding blood. His symbol on the Name-engraved Ring is that of the Brotherhood of Blood covenant. Increases souls acquired for each kill. And now vow to travel a path stained with blood..